S Pressman, Justice and History: the big problem of Wilt Chamberlain. A H Ahmad, N Aziz and S Rummun, Interest Rate Pass-through in the UK: Has the Mechanism Changed during the Financial Crisis? E Makedonas and S Tsopoglou, Does Accounting for Foreign Capital Flows Help to Solve the Feldstein and Horioka puzzle? The Case of Norway. B Philp and D Wheatley, European Work Time Regulation, Surplus-Value and Underemployment among Full-Time Employees: A Cross-Sectional Analysis using the 2009 EU LFS. T Frankel, The Ponzi Scheme Puzzle: A History and Analysis of Con Artists and Victims. M Jerven, Poor Numbers: How We Are Misled by African Development Statistics and What to Do about It. R Guest and A J Makin. Fiscal stimulus: an overlapping generations analysis. J Morgan and I Negru. The Austrian perspective on the global financial crisis: a critique. B Al-Najjar and Y Belghitar. The information content of cashflows in the context of dividend smoothing. A Des’ Adom. Beyond the CFA Franc: an empirical analysis of the choice of an exchange rate regime in the UEMOA. H Sintim-Aboagye, C Chakraborty, S Byekwaso. Uncertainty of inflation and inflation rate: Does credibility of inflation policy matter? P E Auerswald. The Coming Prosperity: How Entrepreneurs are Transforming the Global Economy. E Engelen, I Ertürk, J Froud, S Johal, A Leaver, M Moran, A Nilsson, K Williams. After the Great Complacence: Financial Crisis and the Politics of Reform. James K. Galbraith. Inequality and Instability. S Acharya and R Mohan. India’s Economy: Performance and Challenges. Essays in Honour of Montek Singh Ahluwalia. D Shannon, A Nocella, J Asimakopoulos. The Accumulation of Freedom. Writings on Anarchist Economics. 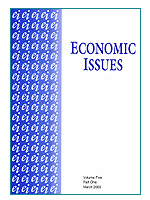 Economic Issues is now on Twitter. View our recent tweets to the right and follow us at http://twitter.com/economic_issues. P Gordinho. Can abnormal returns be earned on bandwidth bounded currencies? Evidence from a genetic algorithm. T Hinks and A KatSaros. The smoking ban and life satisfaction: evidence from the UK. R W Bailey. Human economists and abstract methodology. B Harrison and W Moore. Stock Market Efficiency, non-linearity, thin trading and asymmetric information in MENA stock markets. Frank A Cowell. Measuring Inequality. Paul G Farnham. Economics for Managers. Edwina A Thompson. Trust is the Coin of the Realm: Lessons from the Money Men in Afghanistan. Darrell Duffie. Measuring Corporate Risk.